Experience the tranquility of the Isle of Iona and its restored abbey on Easter Sunday and discover the uniquely different Small Isles as well as a farewell Champagne reception at historic Duart Castle. After weighing the anchor in Oban we set sail through the Sound of Mull to our overnight anchorage off the Small Isle of Eigg. Our first port of call on our Easter voyage is the pretty village of Inverie on the shores of Loch Nevis. The largest settlement in the UK not connected to the road network Inverie is home to the remotest pub in Britain, the Old Forge Inn. After lunch on board we sailed into Loch Scresort and were tendered ashore onto the Isle of Rum for a visit to the eccentric Edwardian folly of Kinloch Castle. We remained at anchor overnight in Loch Scresort. Our first port of call this morning was the Small Isle of Canna where bluebells flowered in abundance. On neighbouring Eigg guests enjoyed an afternoon of strolls before we sailed for our overnight anchorage in Loch na Keal, Isle of Ulva. This morning was spent on the Isle of Ulva where guests enjoyed walks on the island. After lunch we visited Tobermory, Isle of Mull, where guests explored the town. After a morning cruising the Firth of Lorn we arrived at Tiree for walks ashore. We anchored overnight in Gott Bay, Isle of Tiree. This morning guests had the opportunity to attend the Easter Sunday service in the Abbey Church on Iona, or absorb the tranquility of this sacred isle by exploring independently. After lunch on board guests were collected by local boats for an afternoon visit to the Isle of Staffa and the dramatic, cathedral-like Fingal's Cave. We berthed alongside at the Isle of Colonsay overnight. Easter Monday morning was spent on the Isle of Colonsay, either exploring the woodland gardens of Colonsay House or walking to Kiloran Bay under bright blue skies. Our final afternoon was spent relaxing on board as we sailed to Craignure for an evening Champagne reception at Duart Castle, hosted by Sir Lachlan Maclean, ahead of the Farewell Gala Dinner on board. 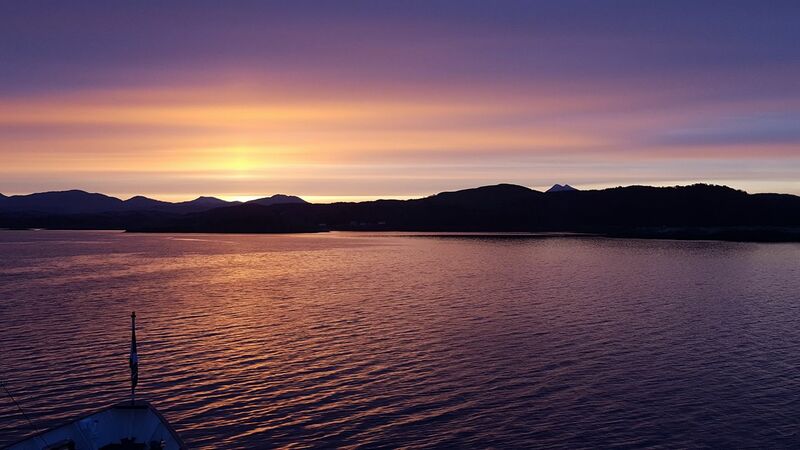 An early morning sail from Java Point in the Sound of Mull brought us back to Oban where disembarkation took place.